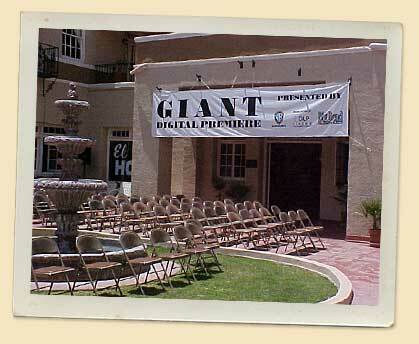 June 7 got here quicker than anticipated, as the entire town of Marfa prepared for the domestic digital premiere of the George Stevens' classic, Giant. More than 47 years ago, the town was all abuzz when the Warner Bros. cast and crew that included Rock Hudson, James Dean and Elizabeth Taylor came in for a three months stay. Now another crowd was streaming into the small town on the edge of the Big Bend, only this time is was a crew from Texas Instruments' DLP division prepping for the big show in a big way. 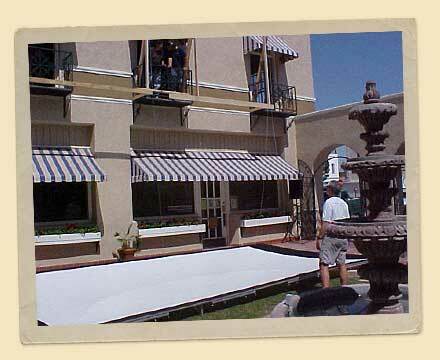 DLP technicians Phil Hoelscher and Denny Foster oversaw a crew on loan from the Hotel Paisano to hang the 18 X 24 foot screen in the courtyard of the old hotel. 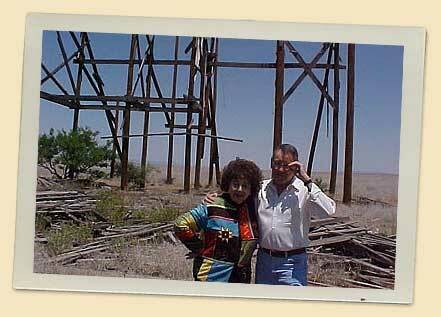 This would be the first movie to be shown in Marfa in more than 30 years. Using the existing balconies for support, Gilbert Montoya, the Paisano's director of operations, constructed a wooden scaffolding complete with cables and pulleys. 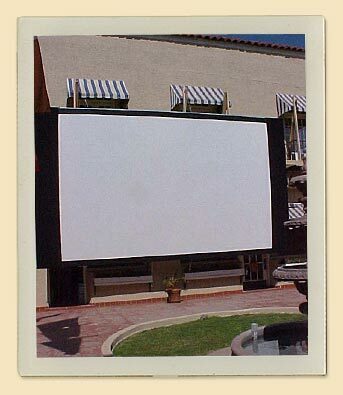 With input from Phil and Denny, the scaffold was built onto three separate balconies while the screen was assembled below. 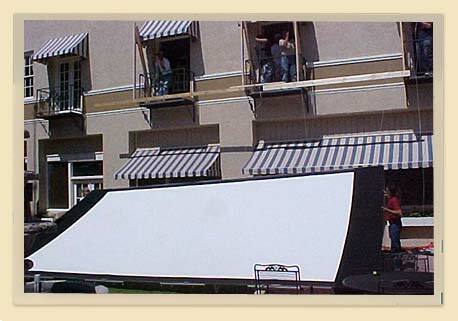 Once it was all ready, a worker had to be placed on each balcony to hoist the huge screen skyward. 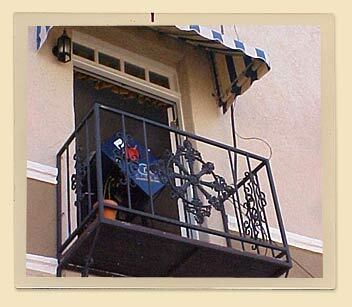 Once it was raised, Gilbert applied his level to make certain it was hanging properly, then it was tied off and secured. 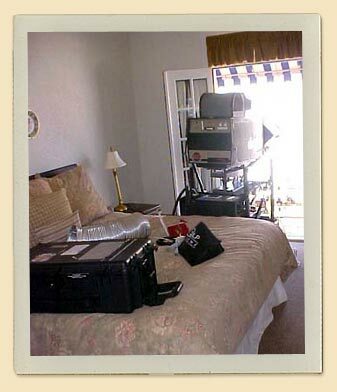 Earlier that morning three men had to carry the huge DLP projection system up into Phil's hotel room located on the opposite side of the courtyard, where it was placed so it could beam the picture out through an open window. Phil slept right beside it for the next three nights. Came Saturday morning and the hotel staff was busy setting up the 150 chairs, hanging banners and cleaning up for the show that night. Everything was put into shipshape condition. A trough was secured from Livingston hardware to put in the nearly eight cases of beer that were donated by the local beer distributors, and extra wait staff was brought in for the evening. Around 11:00 am, our honored guests, Earl Holliman (Bob Dace) and Jane Withers (Vashti Snythe) were driven out to the old Reata set, where so many memorable scenes were shot in Giant. On the way there was a stopover at the Little Reata, James Dean's (Jett Rink's) property willed to him by Luz Benedict. The old windmill and entrance arch are still standing , and look almost exactly the same as they appear in the film. 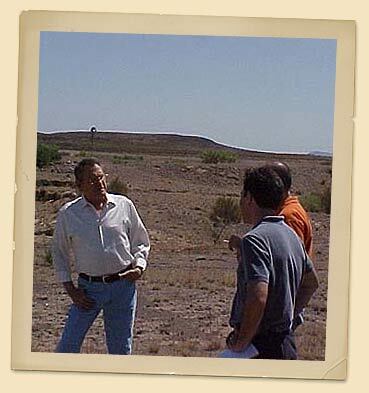 From there it was on to the remains of the Reata, where we were hosted most generously by the ranch owners Clay and Ann Evans. Mr. Holliman and Ms. Withers both got teary eyed out at the old set, and said that they wished it could have been saved somehow. Unfortunately, once Warner Bros. left Marfa, the Evans had to go back to cattle ranching and could not spend the money to preserve the false front. Age, sun and wind finally took its toll, leaving only the treated timbers that were driven into the ground. Before they left, Mr. Holliman and Ms. Withers both took a piece of wood from the old structure as a memento. After an introduction by Warner Bros. Brian Jamieson, it was showtime, and the digital print of Giant combined with the projection capabilities of the DLP system did not disappoint. The picture, in a word, was fantastic. Not a scratch, line or smudge was onscreen. The colors and clarity were so brilliant and sharp that you could almost haved screened the thing in the daytime. The four speakers placed in each corner of the Paisano's courtyard let loose with the stereo soundtrack, and soon everyone was applauding. It was a magical night for several reasons. The main one that after 47 years, Warner Bros. had returned to the little town that helped them film a legendary picture, and did so in a big, big way. The crowd was almost overly kind. They wanted to be there, and it showed. In short, it was a big love fest for the returning stars, Mr. Holliman and Ms. Withers, and they responded generously, signing every autograph and listening to every story. 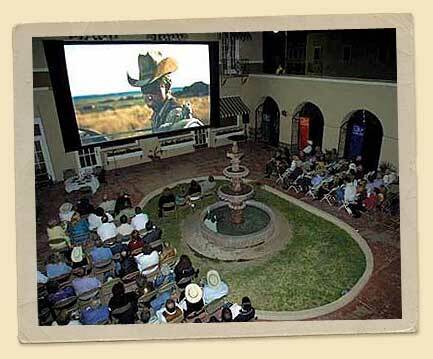 Special thanks to Brooke Williams, Phil Hoelscher, Denny Foster and Cheraina Dunn at Texas Instruments DLP, Brian Jamieson at Warner Bros., Earl Holliman and Jane Withers, Joe Duncan and the staff at the Hotel Paisano, Clay Evans and his lovely spouse Ann, to the Marfa Library volunteers who helped take tickets, Gloria Applegate, Ester Sanchez and Mary Bell Mitchell, and to Gilbert Montoya and the workers who helped erect the screen. It was a great, great night in the Big Bend. For more info click here to go to the FAQ.